Come join Kelly Marie Thompson in Tuscany, Italy, for a Gathering like no other! This all-inclusive destination workshop is an extraordinary immersion into beauty, nature and creativity. You’ll explore medieval hill towns and enjoy delectable Italian meals, all while learning Kelly Marie’s distinct, organic approach to floral design, as well as her best strategies, techniques and insider tips. Plus you’ll be joined by talented photographer, Clary Pfeiffer, who’ll be photographing your work! All this, while surrounded by the stunning beauty of Tuscany. Additionally enjoy yoga, strolls through olive groves, visits into a Medieval town, pasta lessons, wine and oil tastings and so much more. This isn’t just a workshop, it’s a once-in-a-lifetime experience infused with inspiration! For all Details and to sign up, click HERE! Looking for a fun and relaxing new way to create a unique fiber piece for your walls? Come and learn how to weave on a frame loom with Gather Handwoven at Fleur! In this 3 hour workshop, you will learn all of the basics to begin your weaving adventure and create your own wall hanging. This won't be enough time to finish your piece, but you will leave confident to finish at home with plenty of supplies and guidance. We will cover basic weaving techniques, shape building, and compositional strategies. You will take home a handmade wooden frame loom, two shuttles, a weaving sword, tapestry needle, scissors, rod for finishing, weaving booklet zine, and yarn in a curated palette; all in an exclusive Fleur Workshop tote bag! The class size limit is 12 and spots do fill up quickly, so act fast if you would like to sign up with a friend. Light snacks and beverages will be served. Please don't hesitate to convo me with any questions. Please note that the class will be held in our Studio Space at 2706 N Sawyer, just down the street from our retail boutique (2651 N Milwaukee Ave). If you have questions about where it is, you can stop in the storefront and we'll point you in the right direction! Layers of Loveliness will be joining us once again on Saturday, March 23rd! We’re thrilled to partner with Miya, as she teaches the delicate art form of Modern Calligraphy. Your Saturday afternoon begins with a little mix and mingle, enjoying sips and nosh. Miya will demonstrate how to write with the pens and papers she provides. Following you’ll enjoy a floral design class, creating a beautiful, spring inspired centerpiece. You’ll keep your calligraphy supplies, floral arrangement and take it all home in a Fleur tote bag. We’re so excited to once again share this class with you! Please note this class is not refundable, but can be transferred to another person for the same class. Join us Wednesday, March 20th from 6-8pm at Hopewell Brewing for a celebration of lighter days! We’ll be creating crescent wreaths in celebration of the Spring Equinox! Learn how to create a ‘Lunar’ inspired half-moon wreath with our designers. Workshop goers will get to dabble in wreath techniques, creating a floral piece that is light and airy, perfect for brightening up the longer days to come! Each workshop reservation includes one free beverage compliments of Hopewell Brewing. Their seasonally inspired drinks will certainly have you feeling like Spring is here! Workshop Reservations can be purchased here! Spring cleaning isn’t just for your home! 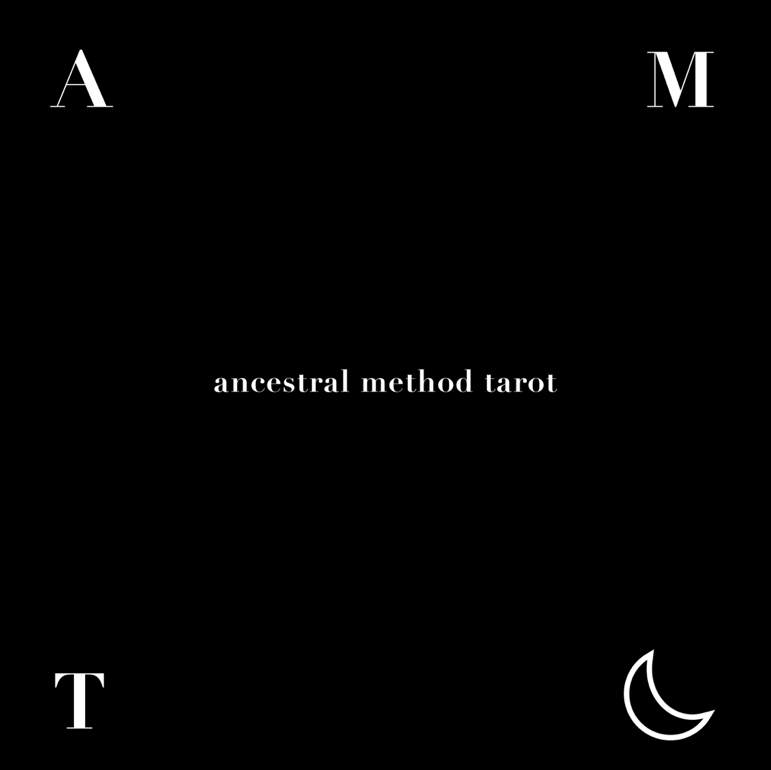 Open your heart and mind to clearing away old energy and embracing the new season with Danielle from Ancestral Method Tarot. Each reading is $20, and begins and ends with a positive affirmation meditation session. Get ready to enter the spring season clear and ready for all the possibilities the universe has in store for you! A waitlist will be available for readings- they are first come first serve! Spring is Coming. A Beer Inspired Floral Design Class at Paddy Long's in Lakeview! We’re super excited to announce a super fun class, partnering with some of our friends in Lakeview! Sign up to join our Spring is Coming floral design, hosted at Paddy’s Long’s Beer, Bourbon & Bacon Bar. First, we’ll listen to a short beer describing and history of American Pilsner’s while sipping on a Deschutes Da Shootz (First beer is on Fleur!). Afterwards, we’ll study the can, using it’s beautiful colors and flowers as inspiration for designing a small, tabletop arrangement in a vase! Using dramatic and bright blooms, we’ll welcome that spring is soon going to arrive. You’ll take home your floral arrangement and the skills to continue designing. 1028 W Diversey Pkwy from 6 to 7:30pm. The price is $45 and includes one beer and all the materials to make your lush and beautiful arrangement! Please note this class is not refundable due to it’s partnership and off site location. Join us Saturday, February 9th for a LOVE-ly, in-store event! We have some SWEET treats in store for you, with Simply Mithai! Get ready for Valentine’s Day this year and meet some of our most LOVED vendors! Pick up some sweets for your sweet with handmade treats by Simply Mithai. Not sure if love is in the cards this year? Danielle from Ancestral Method Tarot will be at the boutique from 11-5 to give one on one mini readings. Each reading is $20, and begins and ends with a positive affirmation meditation session. Get ready to clear your heart and open yourself up to all the possibilities the universe has in store for you! A waitlist will be available in store- these readings are first come first serve! From 1-3pm we will have ‘Friend of Fleur’ Chanel make up artist Liz Monroe at the boutique! Whether you’re kicking it with your closest pals, or getting all dolled up for your boo, Liz will be able to give you tips and tricks to looking absolutely stunning this Valentine’s day. Liz’s make up sessions will be 30 minutes in duration and will include an overall consultation and make up application for $25. DM Liz @lizrmonroe n IG to book your spot today! This February we’re excited to bring to you a Valentine inspired class filled with lush, velvety petals, burgundy blooms and moody florets. Learn how to design a gorgeous tabletop arrangement with our Lead Designer, Katie Dawson. Flowering with pinky-reds, deep aubergine and chocolate, this class is perfect for the romantic or anti love in you. Either way, you won’t be able to be but inspired by the beauty of the blooms. Following your floral design, artist Cindy Phelan will teach you how to paint your centerpiece with watercolors. Cindy’s attention to detail and simple watercolor movements will stay with you to continue painting your creation for days. As always, bubbles and refreshments will be served. Space is limited and this class will sell out. Sign up on our webshop, here! The cost is $135 for the class and materials. You will keep your snips, centerpiece, painting and a Fleur tote bag. This class is non refundable, but may be transferred to another person for the same day in the case that you cannot make it. We can’t wait to see you there. Roving Class with Gather Handwoven! In this 3 hour all-levels workshop, you will learn how to use soft and textural wool roving to create a fantastic and squishy weaving! Techniques covered will be how to manipulate roving as well as soumac, loops, twists, finishing your piece with rya, and taking your piece off the loom. Included in the class is all materials you'll need including: a variety of yarn for texture, lots of luxurious wool roving, and a brass rod to hang your piece! Please note that the class will be held in Fleur's Studio Space at 2706 N Sawyer, just down the street from their storefront location (2651 N Milwaukee Ave). If you have questions about where it is, you can stop in the storefront and they'll point you in the right direction! Looking forward to weaving with you! *Cancellation Policy: Fleur Workshop policy is that class purchase cannot be refunded, but may be transferred to a future class, or you may send a friend in your place. In the case of cancellation, 1 week notice is requested as to notify our waiting list. Join us for a collaboration watercolor painting & centerpiece design workshop on Wednesday, November 7th from 6-8pm. The price is $125 per student. During the first portion of the workshop Jennifer from the Fleur team will teach you how to make a beautiful tabletop centerpiece in a windswept, organic design style. All flowers and materials will be provided, and the centerpiece is yours to keep! Once you’ve finished designing your centerpiece, we’ll shift to painting. Cindy Phelan of C. Phelan Design will help you immortalize your floral centerpiece with watercolor paint. Think of it as flowers, done two ways! Space is limited and this class will sell out – sign up today! Sign up for this class HERE! 735 FLORA VISTA Launch Party! 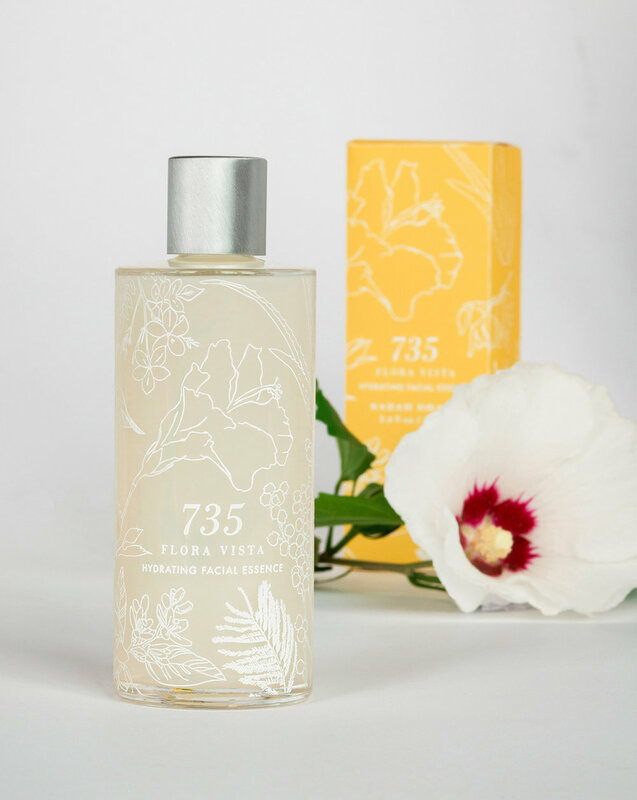 Join us Saturday, October 20th for the launch of 735 FLORA VISTA Facial Essence! From 3-5pm we will have product samples, and botanical cocktails available. So come sip & mingle & meet your new favorite addition to your skincare routine! 3 essential botanicals + 5 active ingredients + 7 days a week = an essence in the palm of your hands. Because skin care is self-care. Join us for a perfect evening of Autumn wreath making! Students will learn basic forms of wreath making in this workshop, and will have the opportunity to work with fresh, seasonal floral and foliage that will dry to perfection! Ease into the fall by working with some of the most precious and fleeting colors, gold ochers, vibrant oranges, and soft yellows will be the foundation of our wreath palettes. All levels of experience welcome! Beverages will be provided and Virtue Cider will be joining us for a fun cider Pop up during the event! Call 773.395.2770 to sign up! Classes are non refundable (Sorry, no exceptions!!). If you cannot make the class it can be transferred to another person, but not another class. -Jane & Rosemary Pop Up Shopping Event! Come stop by the boutique and meet Jane & Rosemary! A Pop Up traveling women's boutique, whose "home" is a 1964 restored Gem Bug Camper! "See Jane. Jane is your Modern Martha kinda gal. Her look is classic with modern flair. Checkout Rosemary. 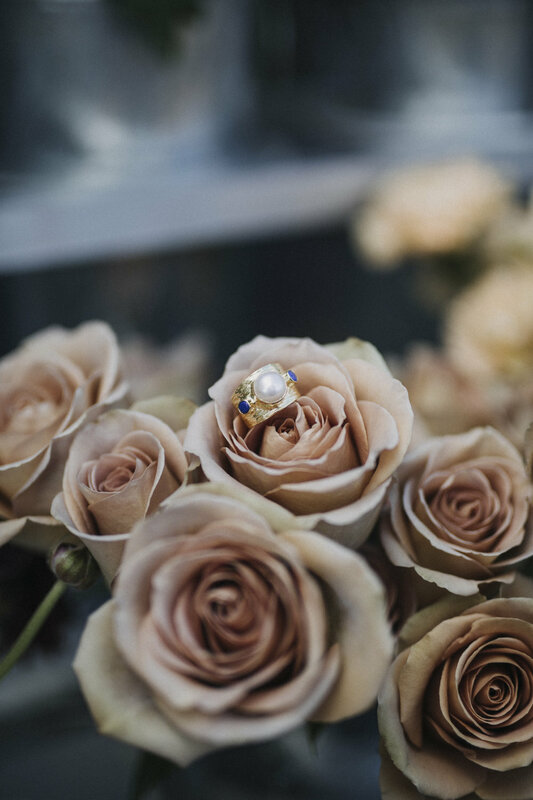 Rosemary is a free spirit and a adventure loving soul, with a polished boho style. Jane & Rosemary was created for all the women who want their closets to flow cohesively from polished boho to classic. The Jane & Rosemary woman knows that their wardrobe doesn’t make who they are but rather reflect their unique spirit. Our hope is that every shopping experience leaves you feeling beautiful, inspired and full of joy!" Additionally, we will be hosting an indoor garage sale! Mark downs from 25-75% select items as well as lots of wedding props! We are clearing out room for new items. See you then! "Autumn is a second spring, when every leaf is a flower." We've been planning this for some time and are SO exited to announce our next collaboration!! This September we are offering a VERY special design class. Sign up to meet Austrian artist Sonal Nathwani. Her paintings are dreamy, lovely and etheral, we can't even believe she'll actually be n our studio! The first part of class you will learn how to create a rich & beautiful floral arrangement. 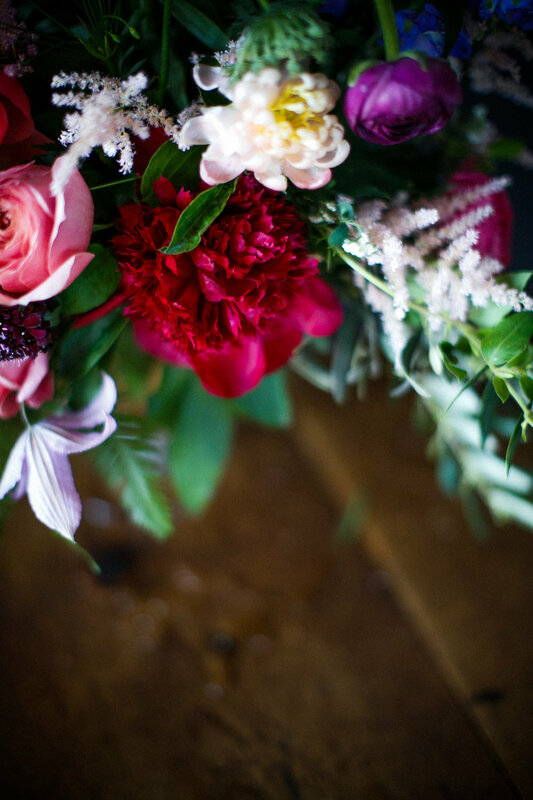 Focusing on foliage and locally grown blooms, this dramatic autumn palette will sure to inspire! Gorgeous focal blooms will be paired with sweet textures, and you'll take your arrangement home in a simple ceramic vessel which will look lovely in any home. Our flower bar will be filled with blooms to take home, and you'l create an arrangement valued at $200! Following class Sonal will teach you how to create a beautiful painting of your work. Using acrylic on a 9' x 12" panel, you will take home all the beauty of your blooms - lasting for years to come! She will teach all the techniques so you can continue painting for years. Sonal has travelled Europe teaching painting, most recently in Rome. It's truly a delight and honor to host her! We'll be serving champagne and delicious nosh from a local restaurant (Details to come soon on who!). This class is expected to see out quickly, so sign up soon! We're absolutely thrilled to have this creative and lovely evening planned, see you soon!!! Collaboration with Plant Shop Chicago! We're over the moon to join forces with our friends over at Plant Shop Chicago! Sign up for this fun, green thumb (Or not!) workshop! This class will be located in their beautiful storefront located at 4601 N Elston Ave, Chicago IL 60630. We'll be teaching floral design, including using the foliage from many house plants! Afterwards, enjoy a wonderful seminar on plant care. Plus, delicious snacks as well. For more details and to sign up, click HERE! Terrarium & Crystal Class Paired with Embroidery! Come get your hands dirty! Join us in Studio Fleur (around the corner from the boutique - 2706 N Sawyer) on Tuesday, July 17th, 2018 and learn how to create your own terrarium! This class we're upgrading our vessel to a beautiful glass and metal, geometric terrarium. Additionally, pick out crystals and stones to add some extra good vibes!! Let us guide you through the design, construction, and care of your own mini landscape using easy-to-care for plants. At the end of the class, walk away with your own handmade, custom terrarium. Perfect for gifts, centerpieces, or just adding a little green to your home, all skill levels are welcome! Supplies and snacks will be provided! THEN once the greenery is planted, fabric artist Serena Madrigal will demo some some embroidery to recreate the crystals and foliage onto cloth! Learn the basics of this wonderful fiber art and take home your embroidered artwork, terrarium, plant tools & a Fleur tote! We are SO excited to announce Honey Fest at Fleur! Stop by June 16th from Noon to 4:00pm and meet the Generation Bee! The makers will BEE here showcasing all their incredible skincare line made with honey from their Illinois farm! Taste delicious samples of Right Bee Cider (with Id) & learn all about their taproom opening this summer in Hermosa! And, Bike A Bee will be in house with locally made honey!! Spend $75 or more and receive a complimentary Fleur tote bag & honey stick! 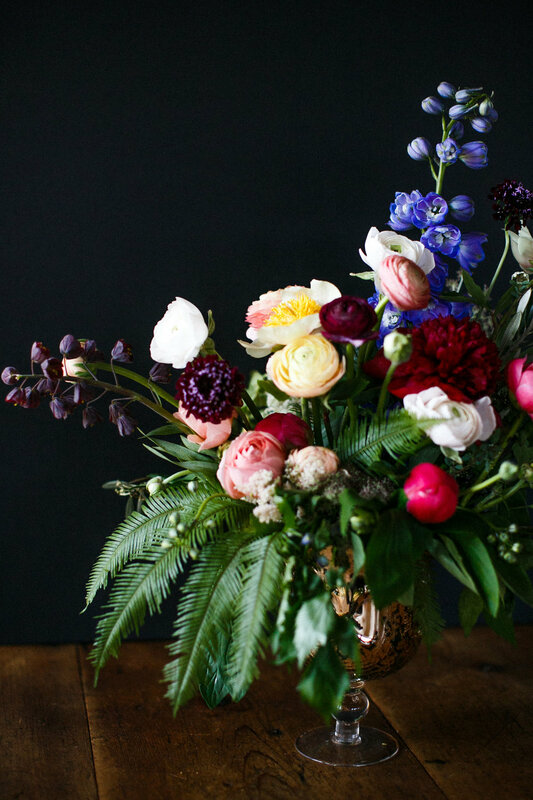 We are so excited to offer our first ever Mother/Daughter floral design class! Join us on Saturday, May 5th for a lovely afternoon of floral design, sweet treats and bubbly beverages! This two hour class will celebrate the time spent with those you love, creating a spring arrangement in the freshest of palettes! This class is $250 for each pair of mother/daughter (or mother figure!). Classes are non refundable. If you cannot make the class it can be transferred to another person, but not another class. Geometric & Gem Stone Terrarium Class! Come get your hands dirty! Join us in Studio Fleur (around the corner from the boutique) on April 21st, 2018 and learn how to create your own terrarium! This class we're upgrading our vessel to a beautiful glass and metal, geometric terrarium. Additionally, pick out a few crystals and stones to add some extra good vibes!! Let us guide you through the design, construction, and care of your own mini landscape using easy-to-care for plants. At the end of the class, walk away with your own handmade, custom terrarium. Perfect for gifts, centerpieces, or just adding a little green to your home, all skill levels are welcome! Supplies and snacks will be provided! Take home your all your tools (so you can tend to your new plant life and make more) and terrarium in a Fleur tote! Floral Design & Embroidery Class! This winter we have been excitedly planning some new classes and collaboration in our studio space for classes and we're so excited to release our first spring workshop to you! March 10th, Floral Design & Embroidery!! This is our first time offering this class with Serena Madrigal, and we cannot wait! Arrive at Noon in our sunny, new studio location - 2706 N Sawyer - just around the corner from our retail boutique. Sip & snack on light refreshments while guests arrive & begin to choose your flowers. We will present a lovely collection of blooms for you to personally pick from, in a bright and seasonal color palette. The morning will begin with a floral demonstration of an organic and windblown arrangement with plush focal blooms by Jennifer Page. Guests then will create their own beautiful floral piece! Once the floral creations are pruned, designed & complete, fabric artist Serena Madrigal will demo some some embroidery to recreate their focal blooms onto cloth! Learn the basics of this wonderful fiber art and take home your embroidered artwork, floral arrangement, vessel & a Fleur tote! Classes are non refundable. If you cannot make the class it can be transferred to another person, but not another class. Sign up for Gather Handwoven's Textural Roving Workshop on Sunday, March 4th! You'll learn how to weave using luxurious, puffy, wool roving & leave with your very own ready to hang wall art piece! All levels are welcome and receive $40 off if you bring your own loom! Sunday, March 4th 11am-2pm in Studio Fleur Inc! Enjoy sweets and treats and leave with all the tools you need to keep weaving! Sign up HERE! Come get your hands dirty! Join us in our brand new studio around the corner from the boutique on March 3rd 2018 and learn how to create your own terrarium! Let us guide you through the design, construction, and care of your own mini landscape using easy-to-care for succulents and cacti. At the end of the class, walk away with your own handmade, custom terrarium. Perfect for gifts, centerpieces, or just adding a little green to your home, all skill levels are welcome! Supplies and snacks will be provided! Take home your all your tools (so you can tend to your new plant life and make more) and terrarium in a Fleur tote! Please excuse our dust! February 20th & 21st we'll be closed for renovations! We are FINALLY installing our new tile (And Team Fleur Inc is VERY excited to no longer have it stored in back!). You know what they say, we always do things for ourselves last! But the wait will be worth it, we can't wait for you to see it! February 4th, Beginning Weaving in Studio Fleur! Please note that the class will be held in our brand new Studio Space at 2706 N Sawyer, just down the street from our retail boutique (2651 N Milwaukee Ave). If you have questions about where it is, you can stop in the storefront and we'll point you in the right direction! Manual.Is Pop Up in Logan Square - Meet the Maker! We're so excited to be hosting Manual.Is on December 17th for a Pop Up! Local designer Craighton Berman will hanging out in the boutique sporting his designs including Manual Coffee #3, The Manual Cocktail Collection & more. Stop by & support your local artist & Meet the Maker! December 17th in the boutique - 2651 N Milwaukee, Chicago Il 60647 10am-4pm! Pop Up with Avrocomy Jewelry! Details to come! Warm up Tuesday, December 5th at Fleur's Herb Wreath Class in our studio! Sign up for a wonderful evening learning the basics from Jennifer on how to make fresh herb wreath that will then dry & use in all your holiday cooking! You'll be provided with all the tools to create a this delicious wall hanging that doubles as a culinary treat. Enjoy complimentary refreshments & take home a Fleur tote! This is a perfect chance to make something for your home or give as a holiday gift to someone you love. This lovely class will be hosted in our design studio located at 2706 N Sawyer. The cost is $75.00 per student. To register, please call 773.395.2770. Please note that due to the limited space, classes are non refundable. If in the event you cannot make it, the class can be transferred to another person for the same day. We look so forward to creating with you!